THURSDAY, Feb. 16, 2017 (HealthDay News) -- A new drug to treat tough cases of the skin condition psoriasis has won approval from the U.S. Food and Drug Administration. Valeant Pharmaceuticals' injectable drug Siliq (brodalumab) was approved for adults with moderate-to-severe psoriasis that isn't responding to other recommended treatments. However, the drug carries a warning about increased risk for suicidal behavior. Psoriasis is characterized by raised patches of red skin and flaking. The condition usually begins between ages 15 and 35 and is thought to be an autoimmune disorder, meaning the body mistakenly attacks healthy cells. 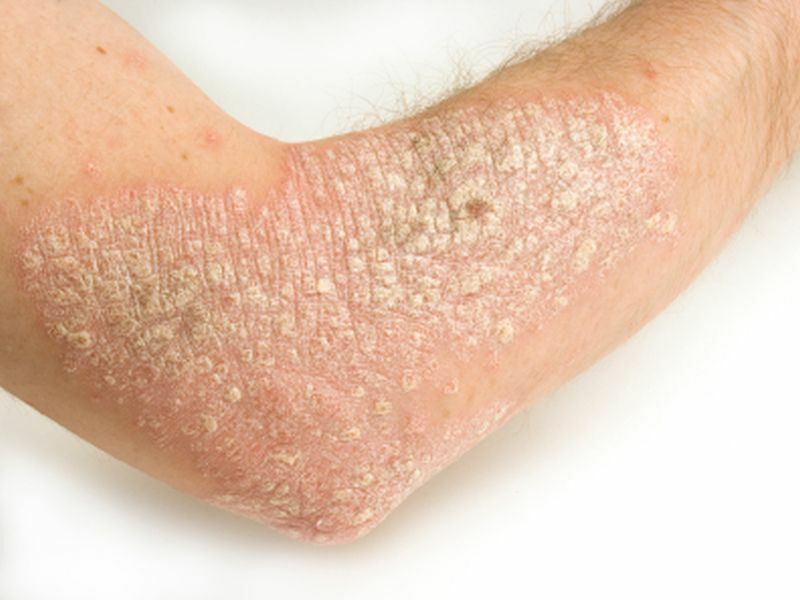 "Moderate-to-severe plaque psoriasis can cause significant skin irritation and discomfort for patients, and today's approval provides patients with another treatment option for their psoriasis," said the FDA's Dr. Julie Beitz. Beitz is director of the Office of Drug Evaluation III in the FDA's Center for Drug Evaluation and Research. The drug is intended for patients who are candidates for systemic therapy -- treatment with pills or injectable drugs that travel through the bloodstream -- or phototherapy (ultraviolet light treatment), and have failed to respond or stopped responding to past therapies, the FDA said. The drug works by inhibiting the inflammatory response that contributes to development of plaque psoriasis, the most common form of the skin disease, the FDA said. Siliq's approval was based on three clinical trials that included more than 4,300 patients. Compared to those who took a placebo, more of those participants who took the drug had skin that was clear or almost clear, the agency said. However, the drug carries a "boxed warning" about the risk of suicidal thoughts and attempts and it's only available through a suicide risk evaluation program, the FDA said. Among patients who took Siliq, those with a history of suicide attempts or depression had greater risk of suicidal thoughts and attempts compared to others, according to trial results. However, a direct cause-and-effect relationship wasn't established. "Patients and their health care providers should discuss the benefits and risks of Siliq before considering treatment," Beitz said in an agency news release. Because Siliq affects the immune system, patients also may have a greater risk of getting an infection, or an allergic or autoimmune condition, the FDA said. The most common side effects reported in the trials included joint and muscle pain, headache, fatigue, nausea or diarrhea, low white blood cell count and fungal infections.